Auris Hotel, Dubai ... a mock-up room. 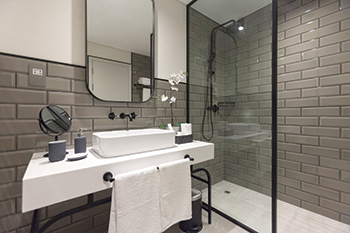 Draw Link wanted to give guests staying at the Auris Hotel an urban yet comfortable vibe. Inspiration was taken from hotels around the world with the ‘urban regeneration’ theme. 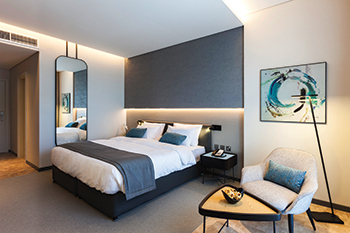 The international architecture and interior design consultancy firm is following the ‘urban regeneration’ theme to do the interiors of the hotel in Dubai’s new Al Furjan area. Having recently completed interior design work for a mock-up room, Draw Link is presently working on other parts of the hotel. Located in the new area between Sheikh Zayed Road and Mohammed Bin Zayed Road near Jebel Ali, the business hotel consists of a basement, ground plus seven floors and a rooftop. Work on the project is in progress and due for completion in Q3 2018. 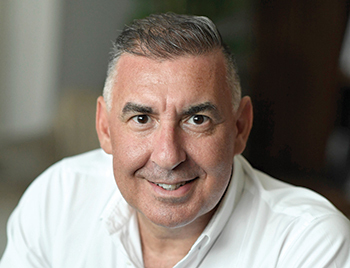 Draw Link Group’s CEO Daousser Chennoufi tells Gulf Construction that the team took into consideration the client’s request, and developed the urban regeneration theme for the hotel to consist of an urban yet comfortable vibe. “‘Urban regeneration’ is a popular international theme that combines hard architectural materials with urban connotations as the foundation, layered with softer materials. The goal is to attain a setting that is urban, art driven, comfortable, and practical,” he explains. Inspiration, Chennoufi says, was taken from various hotel sites that emulate this theme, from Copenhagen to Sydney. In addition to the overall theme, there are also areas that are differentiated in the hotel such as the Mikonos theme. Guests will see the colours and the design change throughout the hotel as they move between its different areas. For instance the lobby area, which is practically designed with open spaces and contains artwork connected to the overall theme, will be different from the hotel rooms, which are themselves outfitted within the overall theme and contain interactive and engaging design elements; and these are different from the pool deck, which has a Mikonos theme that emphasises relaxation and an escape from an urban environment. The designer has used different materials, including concrete, steel, soft furnishings and fabric. “Concrete and steel were the main hard architectural elements used in the design with Georgian overtones to achieve the urban concept. The spaces in the hotel are dominated by hard finishes so the choices for fabrics and soft furnishings were very important,” says Chennoufi. Lighting is used strategically through the hotel to emphasis different areas and stimulate interactivity with the guests. Also used are various other designs ideas such as fresh produce placed on display at the all-day dining areas to positively communicate the quality of food used at the hotel. “We also had practicality in mind, so for instance the lobby area is designed to host a variety of seating spaces so guests can use these as they see fit, whether it is for coffee or waiting for a valet,” says Chennoufi. All of these elements combine to provide an urban, art-driven, and comfortable setting, he adds. The designer has used different materials, including concrete, steel, soft furnishings and fabrics in line with the overall theme. Headquartered in Dubai with branch offices in Greece, China, and Tunisia, Draw Link specialises in hospitality, food and beverage (F&B) outlets, and high-end residential projects. With an experienced team of architects, engineers and project managers, the firm offers services from concept creation to fit-out and management support. It has been recognised with many prestigious international awards. Draw Link is working on numerous projects in the UAE, the GCC, and the wider Middle East region. Its portfolio includes iconic projects such as the InterContinental Dubai Marina Hotel & Hotel Apartments, Hawthorn Suites by Wyndham, Hues Boutique Hotel, Radisson Royal Hotel and Roberto’s Restaurant, amongst others. A prestigious project that it is currently working on is the Rosemount Hotel and Residences by Hilton. Chennoufi says this will be a uniquely designed hotel with awe-inspiring designs. Some of the latest trends in the market, says Chennoufi, include eco-friendly and sustainability design; intelligent and smart technology design, which is currently emphasising automated systems; personalisation; and the adherence to contemporary and classic design. He also sees 3D printing and designing taking hold in the GCC’s interior design sector.